Okay I’m in full-on Fall/Holidays mode over here in KC, so I started thinking about Thanksgiving. I can’t believe it’s in less than two weeks, so I wanted to whip up a side dish for the special day. 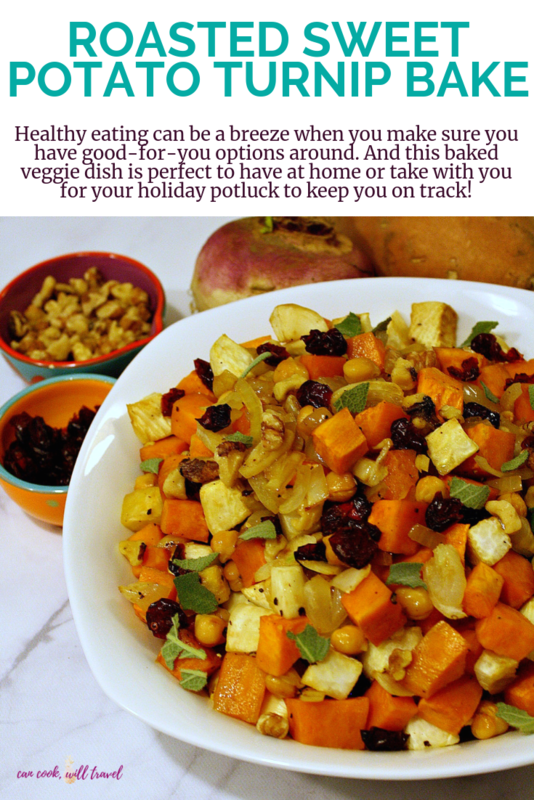 And this Roasted Sweet Potato Turnip Bake came to me this week and I was chomping at the bit to give it a shot. So I’ve got my Fall candles glowing, I’ve broken out my boots and scarves, and have been sipping on Fall flavored coffee. Clearly I’m excited for Fall, and then let’s not forget that I’ve already started watching Hallmark Christmas movies (Christmas in Homestead is playing as I type). Don’t worry though, because my IG stories poll convinced me to hold off on putting up my Christmas decor another week or two. I mean truthfully I was already going to wait, but it was fun to see what the people thought. Now lots of things come to mind when I think of Fall and Thanksgiving food. Our family has major traditions when it comes to cooking, and 2 of them involve cranberry sauce or salad and cheesy turnips. I pretty much love all things cranberry the next few months, so you’ll be seeing plenty of it I’m sure. And turnips are a vegetable I think a lot of people steer clear from, because they don’t know what to do with them. When in doubt, any veggie covered in cheese sauce is a good thing. But to me that’s a special occasion, so I wanted to find a way to make them a bit healthier. 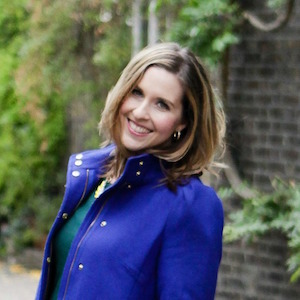 Frankly I was just going to do a post all on roasting turnips, because I’m obsessed. I wanted to put a holiday touch on turnips, so having lots of sweet potatoes on hand came in handy. Mainly because I love roasting both of these veggies, so I was on a mission to create this Roasted Sweet Potato Turnip Bake for the season. 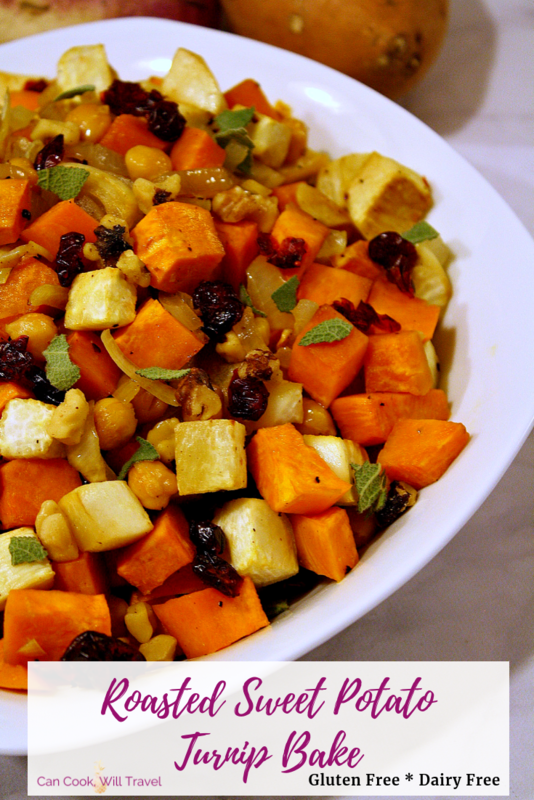 And I love this Roasted Sweet Potato Turnip Bake, because it’s insanely easy. Dice up onions, garlic, a large sweet potato, and a large turnip (or a couple smaller ones). Then roast them for 25 minutes or so with some Garbanzo beans for protein, a bit of avocado oil, salt & pepper, and coconut sugar. I used coconut sugar to bring out the veggies’ sweetness, but you can skip it if you don’t have any. I love coconut sugar for an unrefined sugar option that has a rich flavor. Once the veggies are done, then toss them with some walnuts and dried cranberries. I topped my Roasted Sweet Potato Turnip Bake with sage to add an earthy touch, so it balances the sweetness. Without a doubt, this Roasted Sweet Potato Turnip Bake surprised me in the best way, because it rocked! Seriously as soon as I took a bite, I could envision it in a Thanksgiving spread. Every bite got better, and it’s such a great, healthy option for an indulgent day. 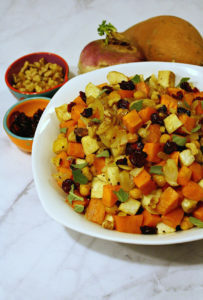 If you need something healthy for your Thanksgiving (or holiday) feast, then bring this Roasted Sweet Potato Turnip Bake. Veggie packed, flavorful, easy to whip up, and colorful, this recipe is a perfect side! So click that link for the full step by step directions and photos. Happy Holidays! 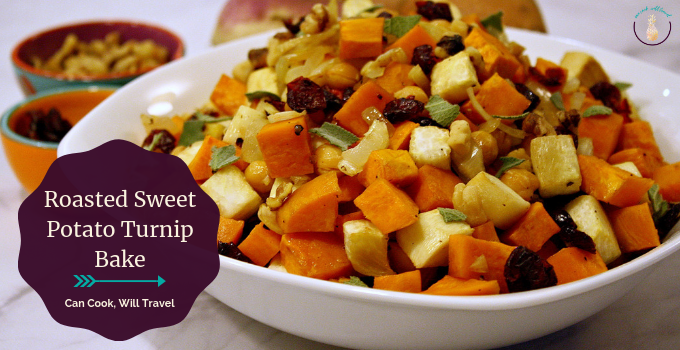 This dish makes Fall cooking simple, healthy & delicious, so start chopping! Preheat your oven to 400 degrees, and then dice up your veggies and slice the garlic while it heats. Place the veggies on a large rimmed baking pan lined with a Silpat and then add the avocado oil, coconut sugar, and salt and pepper. Use your hands to toss the ingredients together, so that everything is well coated. Then bake for about 25 minutes or until the veggies are tender and starting to brown. Let the finished veggies cool for 5-10 minutes, and then toss with the walnuts and dried cranberries. Finally serve with some fresh sage and enjoy! Four years ago: Chia Seed Blueberry Muffins = Healthy Comfort Food! Six years ago: Ka Pow! It’s Kung Pao Chicken! Seven years ago: Monkey Bread!